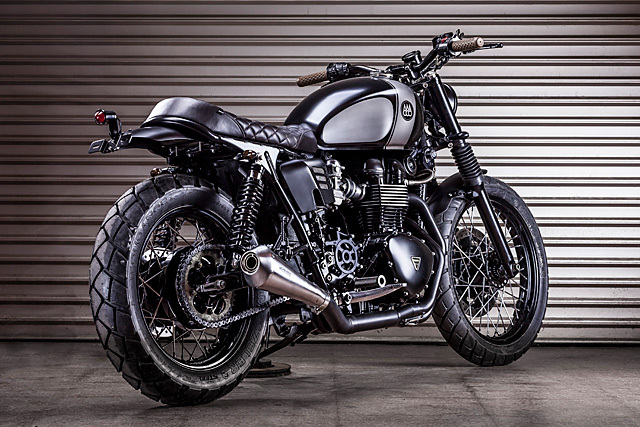 Since they formally founded the company in 2011 Jose and Tito have been churning out brilliant customs from old Honda’s to modern Moto Guzzi’s but when they built their first Bonneville it seems they hit a nerve amongst Triumph fans who liked their builds a certain way. They might now be doing it on a smaller scale, but just like many of those mentioned earlier, they’re getting calls from around the globe for one of their bikes and UK customer Andrew is just the latest to give them a ring. Starting with a computer rendering the Macco team shows their new client what is possible, what they’ve done before and work together to come up with a suitable design. Andrew had a number of features he wanted incorporated into his build that would become his daily ride and with the green light given the Spanish outfit got underway. Starting with a 2008 EFI Triumph Bonneville T100 it doesn’t matter to the boys that this is no rusty old barn find, it still goes up onto the bench for a full tear down and inspection. Happy with what they’ve got to work with the first piece of the puzzle is to do the frame the Macco way and that means chopping the standard subframe, welding in a new up kicked rear hoop and then adding more welds on the frame for extra bracing. This frame has then been hand finished, filled and given a satin black finish for a classic looking foundation. With the big, heavy, chrome fenders removed there was no intention of fitting them up again and instead both ends feature Macco’s own hand crafted fibreglass items for a lightweight solution. Modelled on the stock units but considerably smaller they follow the lines of the tyre at each end perfectly and finished in frame matching black tie in just as well. While the back unit swings from the new subframe, the short front guard uses custom made metal brackets in a punched steel design that utilise the stock mounting holes. 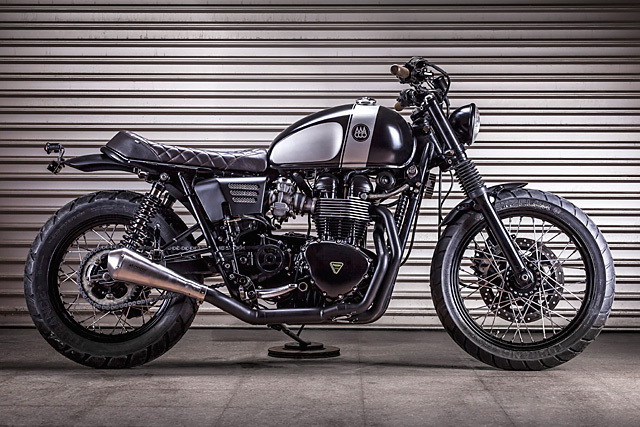 Just like the fenders their considerable work on the Bonneville means that Jose and Tito have come up with some further weight saving solutions that transfer over to many of their Triumph builds. The side covers are no exception, replacing the stock items with fibreglass replacements with stainless mesh inserts for a slightly more aggressive and angular appearance. What they’ve also got down to a fine art is their range of seats and Andrew knew exactly the one he was after; long and low it’ll happily play host to a pillion but with a subtle kick at the back looks just as good riding solo. 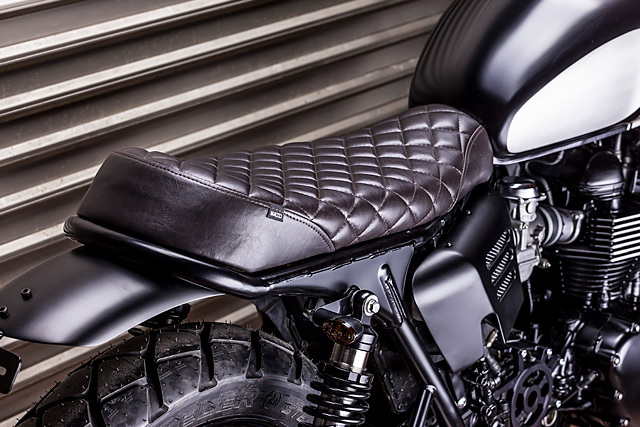 Perfectly fitted to the modified Triumph frame this particular Macco seat is finished in dark chocolate leather with a slightly lighter colour used for the diamond stitching for a timeless look. Stripped of its paint the factory tanks colour scheme was also of the customers choosing with Macco’s incredible use of paint and brushed metal utilised to give the appearance of knee pads. 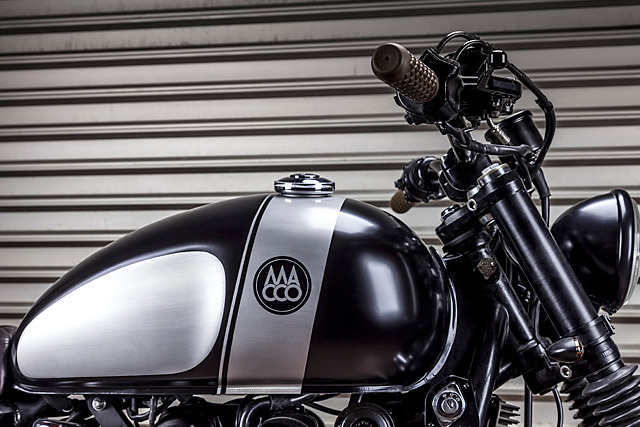 Clever tape work then allows for the main colour of satin black to reveal a cross tank racing stripe with the all-important Macco Motors logo laid down on each side. With the black and exposed metal used throughout the build to create a slightly sinister feel a new headlight was in order to reduce the front end’s smile and a classic Bates style 5″ 3/4 headlight gets the job done. 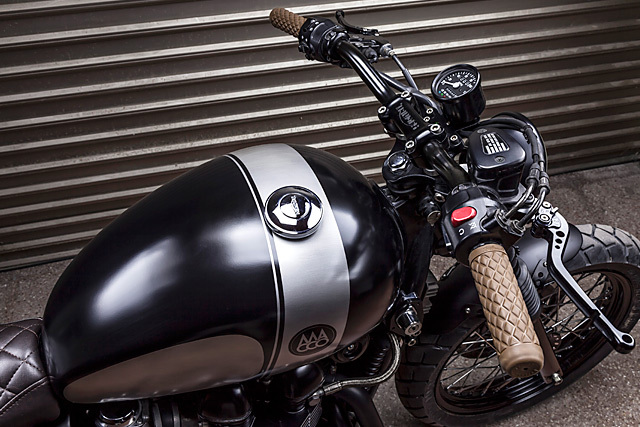 The paint theme is extended even further with the classic Triumph parallel twin getting the satin black treatment on the side and valve covers, cases and heads with the cooling fins file finished for more of that exposed metal feel. One of Andrew’s requests for the build was a 2 into 1 exhaust and Macco obliged with a brilliant custom system that runs the header pipes down the right side of the engine to a merge collector. From here a single pipe joins the ceramic finished system that runs to the rear where it finishes out in style with a quality Spark muffler. Having a bike built this way means you also work with a company that has the experience to set a bike up for your particular needs with all the guess work taken out. 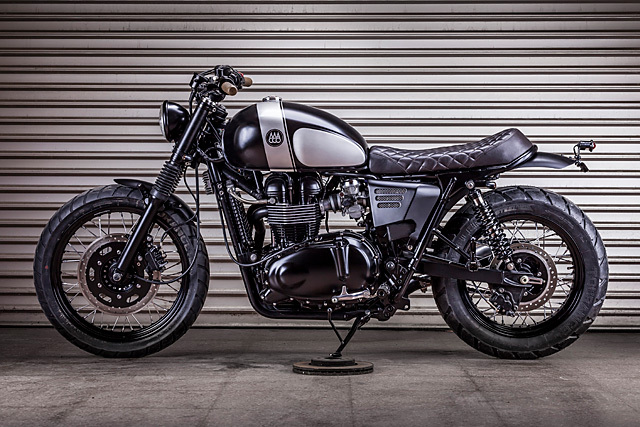 Which is exactly what Andrew got with the handling of his Bonnie with Macco’s experience in selecting and tuning the best bits for the job. The standard front forks now feature Progressive Hagon front springs with Hagon’s own low friction fluid in the right viscosity to match. So that no chrome of the stanchions shows through, the exposed metal below the trees is covered by gators while a custom set of sleeves in body matching paint is fitted between the top and lower trees. At the rear end the twin shock setup remains in place for the classic Bonnie look but the stock shocks have been shown the door in favour of fully adjustable Hagon progressive nitro shocks tailored to suit the rider’s size. To keep the feet from slipping in hard riding heavily gripped alloy pegs in black have been fitted up with a matching set folded away for the pillion. Steering duties have been turned over to a new set of tracker bars from the increasing popular Biltwell brand. With their Torker grips in a natural finish getting the nod and sit alongside the standard switch gear. Adjustable levers add to the custom feel of the front end with the standard clocks removed and replaced with a small speedo reading MPH for the new British owner. The wiring has been simplified for a cleaner look and both the regulator rectifier and the ignition switch have been relocated. While having already replaced the front headlight the rest of the lights are replaced with new indicators in a tinted amber finished front and rear and an old school tail light with number plate bracket mounted to the Macco Motors fender. 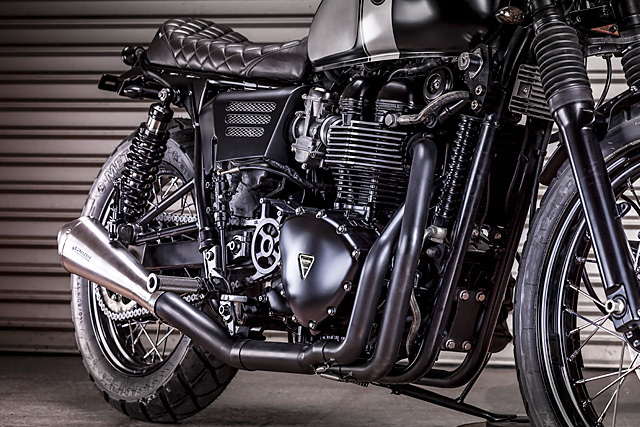 With the black and raw metal theme throughout and the dark vibe of the Triumph pulsating across its appearance the addition of an LSL sprocket cover to reveal the mechanical movement adds a tough dimension. To wrap things up the spoked wheels were stripped of their rims which have been given a coat of satin black from Macco’s now diminishing supply and the hubs get the same treatment. These have been wrapped in all new Metzeler Tourance go anywhere rubber with a bump in size to a 110 on the front and a meaty 140 section rear. Tuned and tested The Trickster is on its way back to the UK after a brief stay in Spain for the full Macco Motors treatment. 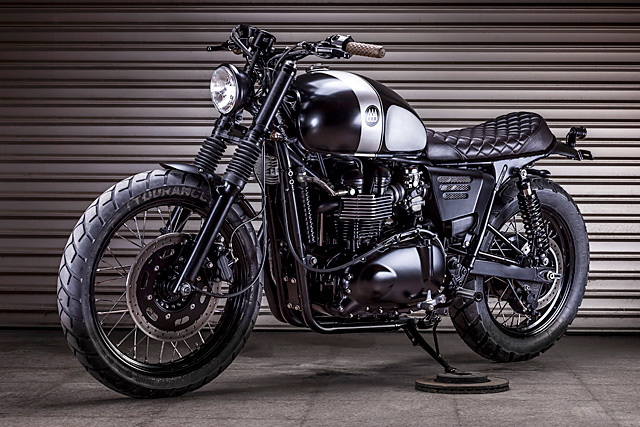 Jose and Tito may have never meant to go down the path of limited edition Bonneville’s but when the product is so good, the demand so high and a professional outfit always needing to refill the coffers it’s only a matter of time before another fan makes the call to place an order for their own personal edition. Maybe next we’ll see an all new water-cooled Bonnie get the treatment and if that tickles your fancy then the boys are only a phone call away!